My husband and I are spending a few days at the beach. 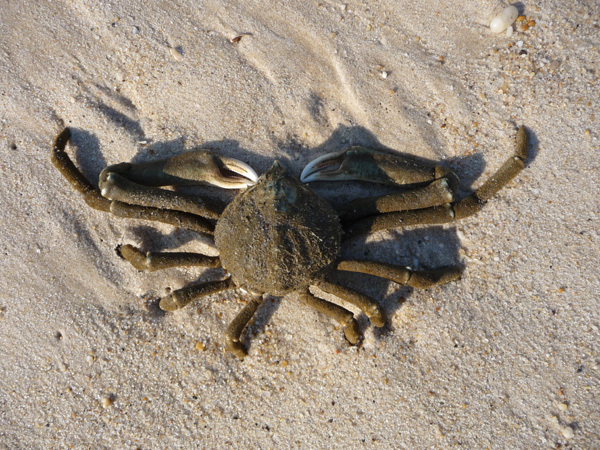 We love to take long walks on the beach early in the morning, and spend time collecting shells and learning about the variety of fish, crabs, skates, skate egg sacs etc that we see. One of my grandsons asked me to start a shell collection for him and in the last few days I found a good selection: clam, scallop, oyster, moon snail, whelk, mussel and slipper shells. 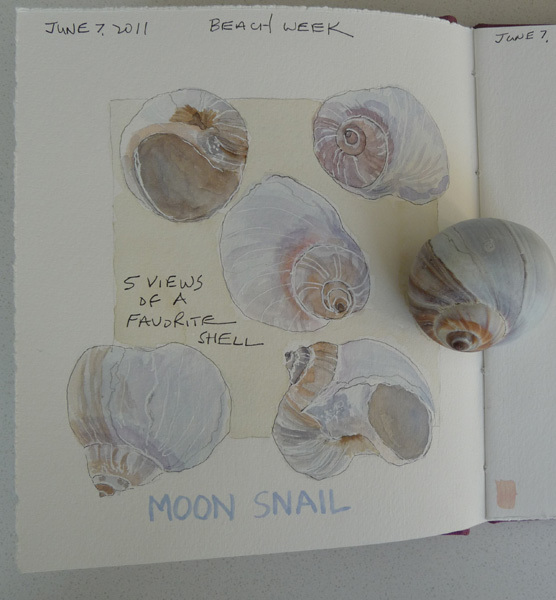 Today I painted 5 views of the largest and prettiest intact moon snail shell I found. Now I look forward to tomorrow's walk - we never know what we shall find! Memorial Day in Washington DC. My husband and I spent a long Memorial Day weekend with our son, his wife and our 3 year old grand daughter Annabelle in Washington DC. When she was born, I started a sketchbook for her and I routinely fill one page each day that we visit. It is part travel sketchbook and part visual journal of our days together. I completed 4 pages during this visit and I'm including them in this post. Prior pages can be seen by clicking on the Washington DC category at the bottom of the right-hand side bar. The sketchbook is a 10" x 7" Cachet Linen watercolor sketchbook - the same one that I used for all of our trips to London. I can work on both sides of each page, but there is a little buckling that you can see when the page is scanned. 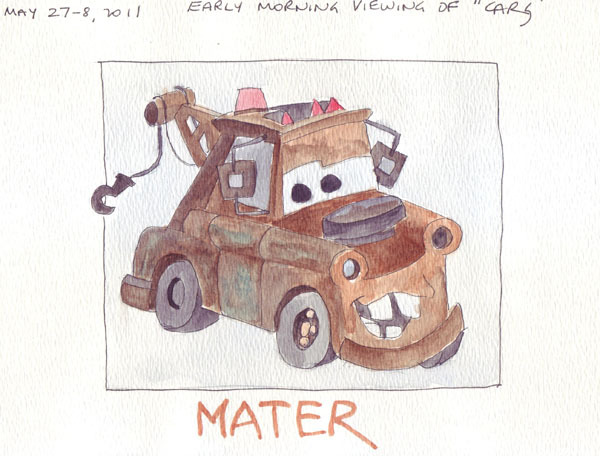 We watched the Pixar movie "Cars" our first morning and she requested that I draw and paint "Mater." 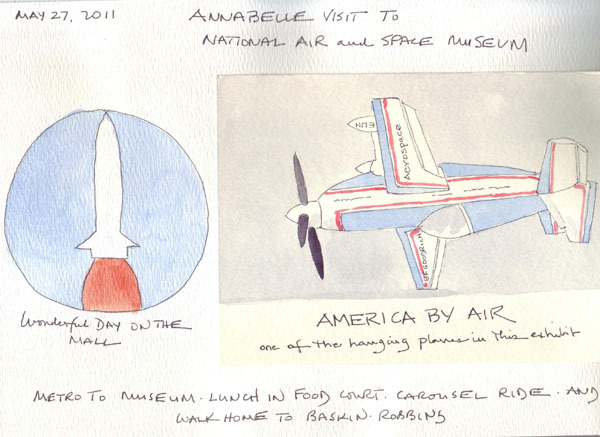 We took Annabelle to the National Air and Space Museum on the Mall and while my husband took her through her favorite simulators, I sketched an aerial airplane and painted it later from a photo I took. 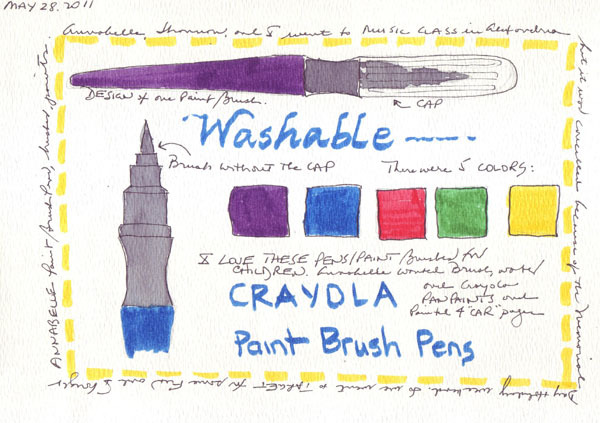 One morning I took Annabelle to buy art supplies and thought that she would love using the Crayola Paint Brush Pens. But after she used the first one, she insisted on using the other new brushes and Crayola pan watercolors I bought - and I couldn't convince her that the brush paint pens weren't markers! 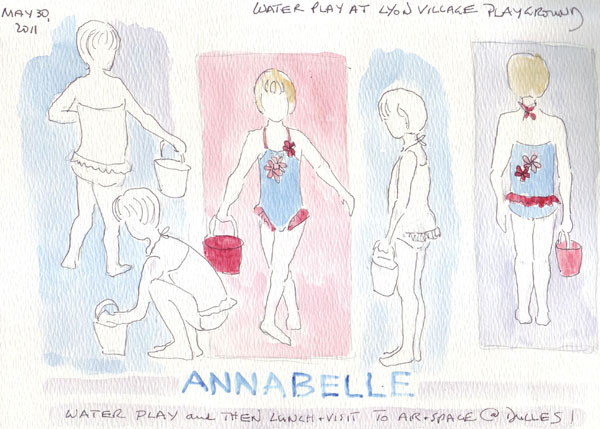 It was really hot in DC all weekend, and Annabelle spent several hours with one of her friends in an Arlington playground with lots of waterplay. 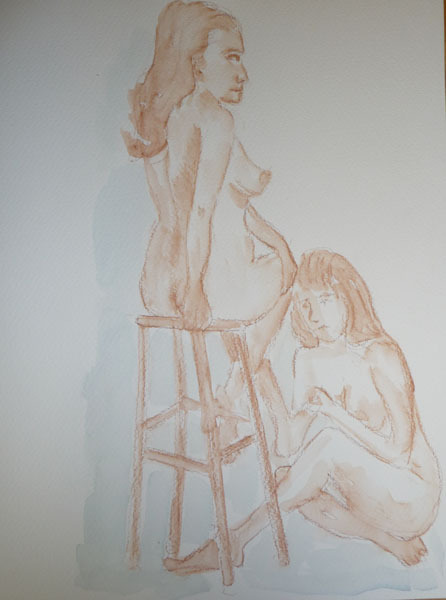 I sat in the shade and did quick sketches of her, pail in hand, to record the event. 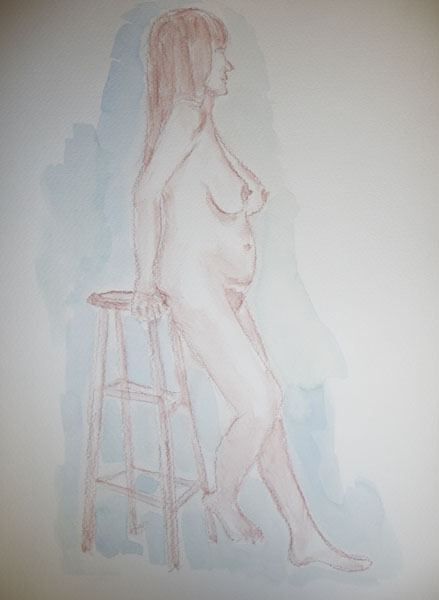 I'm posting the three 20 minute sketches - all done with watercolor pencil, then clear water, then watercolor paint around the images. My paper is bigger than my scanner, so all 3 pages were photographed and I couldn't get rid of the blue gray color of the paper, even with Photoshop levels. I was fascinated with many of the images on prints in the German Expressionism Exhibit at the Museum of Modern Art. 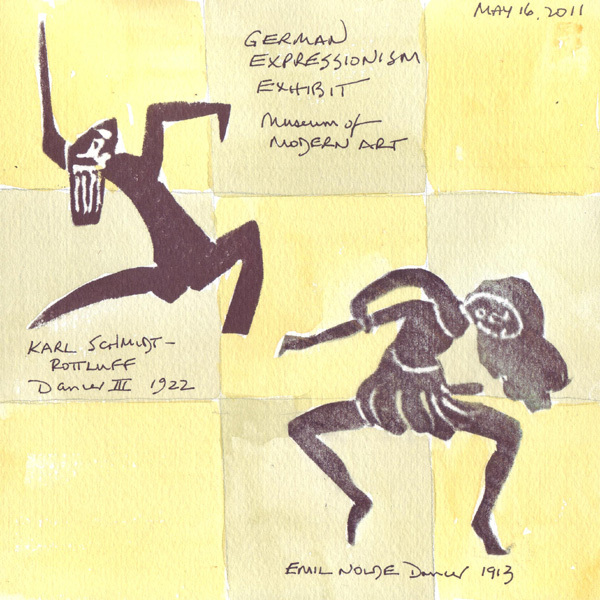 At each visit, I made some quick sketches of some of the figures in the prints, and this week made two of the dancers into stamps. The first test of the stamps was made on this journal page. Jane Davies posted some lovely mixed-media art with gesso, acrylic paint and freezer paper resist on the Sketchbook Challenge blog. I went to her video link on her blog and tried to duplicate it, but it failed. My freezer paper image, an outline of 6 of us on Team 5 at an NYC scavenger hunt, didn't stick properly and paint went under the resist. So I dried it, turned it over, and glued it down as a collage. I definitely will try this again, and will probably use paper Frisket instead of my old freezer paper. I met my friends Pat, Melly, and Gwen in Brooklyn on Friday to celebrate Melly's upswing week (week 3 after chemotherapy) and had a wonderful day wandering the Botanic Garden and the Art Museum. It was my first visit to the Gardens - WOW! The wisteria and tree peonies were unbelievable. The website says there are 300 tree peonies in bloom! Go see Melly and Gwen's blogs for their sketchbook pages and some photos from the day. 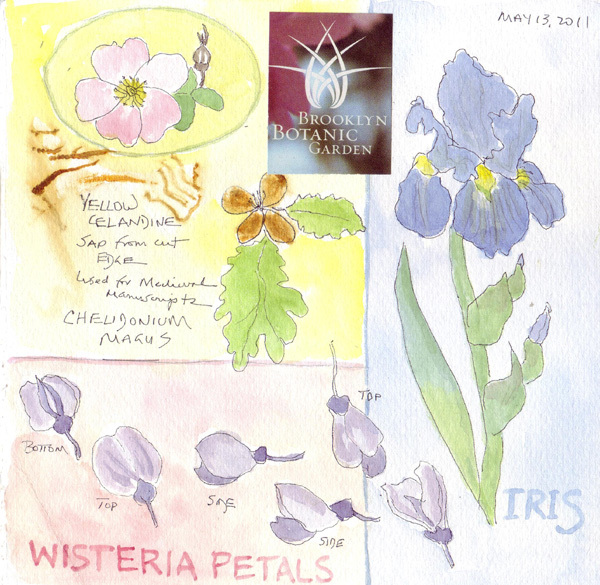 I sketched a little (in pen) as I walked and Gwen taught us about the Chelidonium Magus plant whose sap was used as pigment in Medieval manuscripts. The yellow squiggly lines and the yellow flower on my sketchbook page are all from the sap of the leaves when you break one off the stem! Amazing! 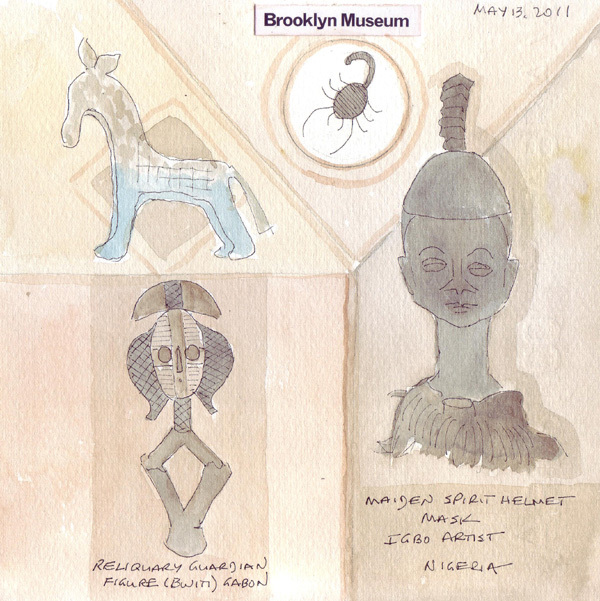 After a lovely lunch on the patio in the Gardens, we walked next door to the Art Museum and spent most of the time sketching in the African Arts section. Then we took a quick tour of Judy Chicago's Dinner Party and the current exhibit in the Feminist Art Center. It was a fantastic day - and a very easy trip for me from Manhattan to Brooklyn by subway.